SANTA CRUZ >> In a neighborhood where living space is eked out by the square foot, a half acre on Raymond Street of verdant growth, towered over by 10-foot corn stalks, is something of a roomy oasis. Tomatillos, cucumbers, nopales cactuses, beans, chayote, peppers and more line up in the roughly half-acre property that sits amidst tightly packed rental housing and adjacent the petite Poets Park. The Giant Dipper’s clack-clack-clack as its roller coaster cars climb their tracks is audible at the nearby Santa Cruz Beach Boardwalk. 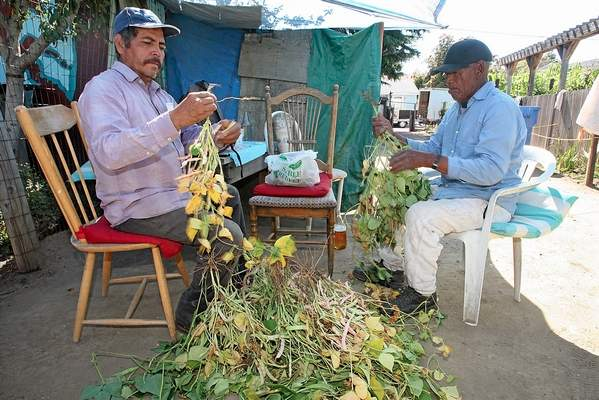 The Beach Flats Community Garden — Jardin Del La Comunidad De La Playa to its users — has been a well-used neighborhood staple since 1994. In March, users, many first-generation Latino immigrants with farming backgrounds, were notified that the public space’s days are numbered. Boardwalk parent Seaside Co. will take back the majority of the space from the Santa Cruz Parks and Recreation Department, who manages the site, in November. The city plans to continue to lease a portion of the garden closest to Poets Park, said Parks and Recreation Director Dannettee Shoemaker. The remaining garden parcel and Poets Park will be redesigned to create a smaller community garden, she said. Seaside Co. spokesman Kris Reyes said the company is proud to have made the space available to the community for the past two decades, but that the time has come for new uses. “We are going to be using the land for agricultural purposes to support the landscaping in the park and in our surrounding properties,” Reyes said. Prior to the garden’s establishment, the property was used for illegal dumping, camping and drugs, said Shoemaker. She added that the city plans to hold a community meeting by summer’s end with the gardeners, to better explain the transition. Michelle Glowa, an anthropology and social change assistant professor at the California Institute of Integral Studies, first got to know the gardeners four years ago, when she rented her own plot for a year. Monday, she interpreted for several of the gardeners who did not speak English. Domingo Mendoza, she said, has threatened to return to Mexico if his garden space is taken away. Jimenez, raised in Guanajuato, Mexico, only took on his garden plot two years ago, but has been visiting the site and its “viejos,” or old men, for the past six years. Family members, friends and visitors stopping by the garden are unlikely to walk way empty-handed or without a long conversation with the gardeners, he said. Nestled around the garden are shaded seating areas and tables, where the gardeners talk, play cards and music while taking a break.